Geek Fuel is now Geek Fuel EXP! 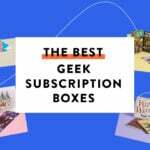 EXP is a quarterly subscription box filled with tees, hoodies, comics, and goodies – they promised $100 in value for every box. Geek Fuel used to always feature a Steam game in their boxes – just a heads up, that isn’t the case anymore! UPDATE: The EXP box WILL feature a Steam game with every delivery – they will be delivered via email, and the game has yet to be sent out for Volume #1. This box was fully loaded and HEAVY! The first shipment comes with 7 items across 7 different fandoms. For even a bit more of a surprise, a lot of the items came in their own little containers! Pop them open to reveal the items! The Wade-Y Bunch T-Shirt – Value $15? 8 Deadpools on one shirt – yes, please! I love the idea of Deadpool in the Brady Bunch scenario as well – he can really show off his character range. The back even has a little Deadpool logo on the upper neck. Let’s just take a second to acknowledge the greatness of this packaging! Bob’s Burgers Makin’ Apron – Value $20? I am really into this big, bold, Bob’s Burgers graphic! It’s really well made – the material feels very durable. How awesome does it look!? Again – the packaging is just top notch. It really adds that little bit more to the unboxing experience – it’s like opening a big gift full of little gifts. Cowabunga Pizza Cutter – Value $15-20? Geek Fuel felt like it was getting away from some of the great exclusives they’ve had in the past – so it was such a great unboxing experience to find this awesome exclusive in the first EXP! What better way to cut the turtles’ favorite food than with Rafael’s sai inspired pizza cutter! It definitely feels well-made, like all of the items in the box, too. GITD Night King Titans Vinyl Figure – Value $5-10? This item was one of the only items spoiled ahead of this box shipping – it’s a 3-inch exclusive glow-in-the-dark variant of the Night King. If you’re familiar with Titan vinyl figures, then you know exactly what you’re getting. This is their body style for all of their vinyl figures. The Geek Fuel box even inverts to give you the castle background scenery for your figure. It looks very cool in the dark! Wolverine #1 Comic Cover Canvas – Value $15-20? I love me some canvas comic art – so this item was speaking my language. It’s the cover of Wolverine #1 on stretched canvas – it’s about the same size as a typical print you’d get in a geek box – but this is much higher quality and ready to display. Again, all of the material is high quality. And it arrives with the hook for hanging it up. On the case, it mentions this is a part of a “Canvas Collection” – so I hope we see more in future boxes. The only non-exclusive item is this big, 9×11, LEGO Star Wars book. It wouldn’t be LEGO without a minifigure! There are about 100 pages full of Star Wars lore told with LEGO characters. This could be a fun coffee table book or a great way to introduce the younger generation to The Force. Planet of the Apes Pin Palz – Value $15-20? I used to value their single Pin Pals around $5-10 – with this being a double set + button pack, $15-20 felt fair. You’ll get a mini ANSA button in your pack. Then, everyone gets 2 of 6 possible pins – with one rare variant in the bunch – did anyone get it? Verdict: My values add up to around $122 for the first-ever EXP Geek Fuel box – that leaves a bunch of room for value interpretation to still hit that $100 guarantee. On top of the value, I was happy that everything felt very well made – if you’re going to shell out $65 for a box, then it should feel high quality and without filler – I think they did that with their first box. What did you think abotu Volume #1 of Geek Fuel EXP? I was pleased with the first EXP box. They did say that they will be doing hoodies though when they switched from monthly so that better happen if they want to keep people. Looks like they are not adding one in the second box. Maybe waiting for the fall/winter quarters for hoodies but I live in michigan so you never know when I will need a hoodie LOL. Used the pizza cutter last night works great. this does not look like it’s worth $60+. don’t think I’ll be getting the next one without seeing a review first. I love all things Bob’s Burgers. It would be awesome if they included the cookbook sometime. Great items! Too many fandoms in one box, IMO. 7 items from 7 different fandoms at this price point means I’ll probably rarely sub, if ever. It would be unlikely that I’d like enough of the fandoms in each to justify the higher cost. Bummer, as this was my favorite Geek box. Honestly, most of this I’ll give away or try to sell but that being said there are a few things that I like. The shirt, the wolverine canvas art, the pizza cutter most definitely but most of the box wasn’t really stuff that I like. I’m hoping that the second edition has more within my fandom choices. The website said you also get a Steam game each quarter. I’m curious about this as it’s a significant bonus for me given how much my son loves Steam games. Do you know what the game was this quarter? I may need to order this box! That may be old messaging because the monthly box used to always come with a Steam game – this box did not. Just to follow up on this – there are Steam games in the EXP box! The owner let me know that they will be sent out via email instead of being in the box. They haven’t been sent out for this box yet. That’s awesome! Will you update this review when you find out more about the game? Thanks so much for the reply! Jessica from Geek Fuel here! As Eric said, the Steam game for EXP Vol #1 will be sent separately in an email soon. Steam games will still be included in future EXP volumes. Is there any update as to when the steam game emails will be sent out? Haha I wanted to put Like on the picture of you with the apron! Looks good on you!